I am an artist based in La Pine, Oregon. I have a degree in fine art with an emphasis in illustration. I have been designing jewelry for 8 years and recently began collecting and shaping stones in my lapidary. When I am not out in my shop making things, I am in my house crocheting or remodeling. In between all of that, I like to write and read. I have a congenital condition called Ehlers-Danlos so you might see mention of that here as well. Welcome to my pea soup of creativity life! Enjoy. This is the beginning of a story that will carry on for years. 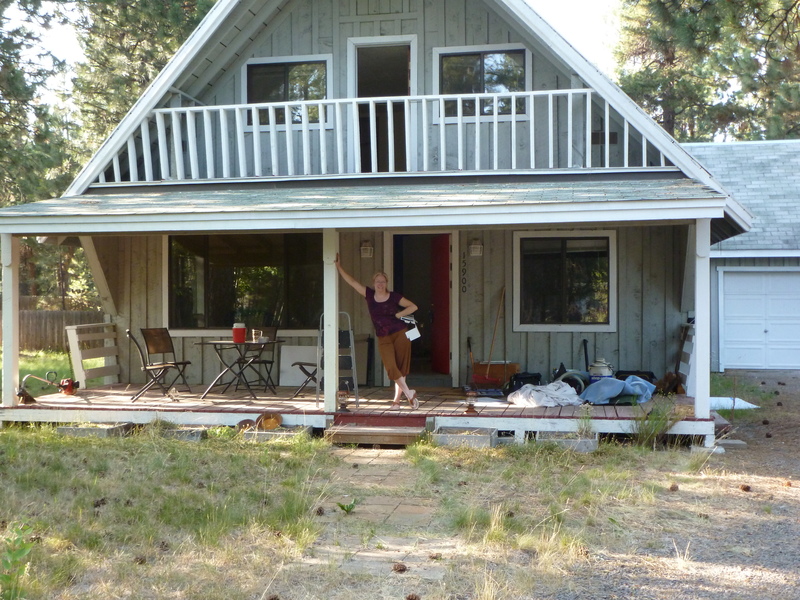 Back in 2012, my husband and I purchased this home in La Pine, Oregon which is a very small town just south east of the center of Oregon. The climate there is referred to as “high desert”. Dry air, cold nights, perfect days and lots of blue skies. The air in La Pine smells like apple sauce in the spring and vanilla in the morning when the sun just starts warming up the Ponderosa pines. If TV had smell-o-vision, they would have added this smell to the Bonanza series, because without it, there is a large piece of authenticity missing. When I met my husband (#3 I confess) back in 2006, we bonded over a shared dream to have a cabin in the high desert of Oregon. We joked about designs we would add, like a trap door in the middle of the main room so I could sweep all the junk under the house. I lightly argued about the placement of the wood stove and whether or not we would have indoor plumbing. It was a dream but one that was fun to imagine. If you read my first blog, you will find that I once had a sizable nest egg that was subsequently seized by the IRS. Well, in 2012, 4 years after the money was taken away, the IRS unexpectedly refunded almost 1/4 of the money and as a result, we started thinking about making our little dream a reality. We had already been looking at houses on a Bend, Oregon real estate site so the next step was to find out how much financing we would be able to get. I went to our local USBank, where we held a checking account and met with their mortgage specialist. I won’t mention her name, but needless to say, after a confusing and very curt meeting she calculated a sum of $130K and I left feeling like an uniformed idiot. As a first time home buyer, I had a lot of questions about terminology and the difference in finance rates for manufactured homes, property and “stick built” homes….which was a term I had only learned when she abruptly corrected me. She made me feel foolish and immature. So, in typical introvert style, I left with visions of whomping her WWF style and instead drove home like I was Mario Andretti. We now had a number to work with, so we wasted no time hoping in a car and driving 4 hours to get to Bend. The Realtor we met, Nancy, we very genuine. It was February and the roads were covered in slush and ice. We drove the 1/2 hour from Bend to La Pine in relative silence as I admired the small pile of rocks she kept in the cup holder of her SUV and pondered what the day might bring. My husband had been armed with a sheet of listings he had pulled off the internet and Nancy plotted them in order of nearest to farthest away from Bend so we would have a feeling for how long a commute we might have for employment and significant shopping. LaPine….or is it La Pine….can’t get a real answer on that…is a township of about 5000. Rural Highway 97 cuts right through it connecting California with Canada. There are a few fast food restaurants, a small grocery chain, and even a Best Western, but mostly, it is a town that you might overlook as you passed through. While that is difficult for the economy, it makes it nice for those of us who grew up in and appreciate small towns. Back behind the familiar corporations that line the highway, there are fabulous restaurants, wonderful gift and craft shops and the friendliest hardware store I have ever been to. It would behoove you to stop if you are ever in the area and get the BEST Mexican food and service at Cinco de Mayo…or go to the Red Rooster for breakfast….and if you are crafty and like cloth the Quilt shop will literally leave you salivating. Enough said, La Pine was the place for us. The first thing I noticed as we pulled off the highway was that the majority of roads were not paved. HUGE puddles of indeterminable depth blocked many of our paths, but Nancy waded through like a pro, even bottoming out her SUV at one point, in a hole so deep that there was a muffler left behind by a previous driver. We bumped and slushed our way for miles and came to the first house on our list. And here I will leave you for a bit because I KNOW you want to go and research La Pine, Oregon and get a good visual before I continue. In blogs to come, you will hear a home buying nightmare, a costly victory and continuing takes of renovations, decorations and the ETSY business I try to keep afloat through it all. It has been a CRAZY year!